Hearts represent love in all its many aspects and they are also seen as symbolizing 'having' the power of courage and will. To the ancient Egyptians it was the heart, rather than the brain, which was seen as the organ that held the person's mind and soul. 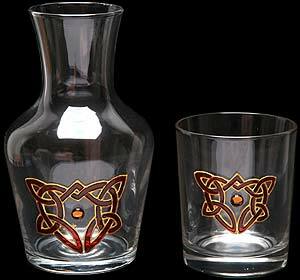 Our Celtic Heart glassware has a simple design representing the endless path of eternal love with a golden gem placed at the centre of the heart. Truly a gift of the heart.